Fully Automatic Filter Seaming Machines. Top Quality Filter Seamers. Fully Automatic Single Head Spin-On Filter Seaming Machine. New Seaming Head Design allows for Seaming of Filters with Sheet Thickness’ up to 1.50mm (0.06″). 4 Roller Double Seaming design for consistent leak-proof Seaming. Filters with Ends are fed on the machine on pucks (filter holders) made from nylon. No Filter and No Cover – No Seam Safety checks. Quick size changeover time. 20 minutes for diameter changes and 5 mins for height changes. All safety covers are fitted with safety interlocks. Available with optional full machine enclosure and Loop Conveyors for continuous movement of Pucks (Filter Holders). CE model with full enclosure available. Filters with Cover Assemblies are placed in the Pucks (Filter Holders). These are fed from the conveyor into the machine, Seamed and exited from the opposite side of the Conveyor. 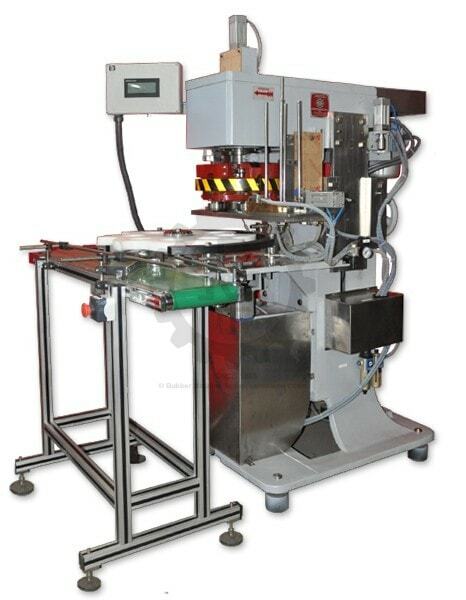 The machine can be fitted with an Automatic Cover Feeder depending on the Cover design. Machine shown without standard Safety Guards and Covers for clarity.